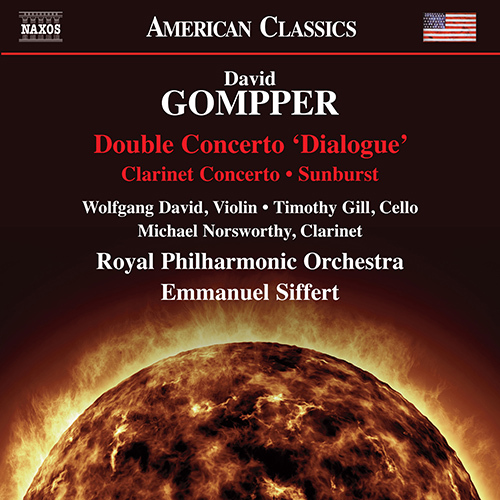 These world premiere recordings of works by award-winning composer David Gompper reflect his recent interest in the concerto, as well as his evolution of approach through increasing complexity in time and space, textural landscape and narrative detail. TheÂ Double ConcertoÂ ‘Dialogue’Â covers moods from lyrical to argumentative and inconsequential chatter to deeper reflection, while theÂ Clarinet ConcertoÂ relates to the energy and skill of the Parkour runner. The explosive colours ofÂ SunburstÂ are associated with the star-shaped proportions of the Farey numeric series. Gompper’s exquisiteÂ Violin ConcertoÂ can be heard on Naxos 8.559637.